GlassAct Studios is introducing custom made glass inlays for the memorial industry. Finally, a product that addresses the need for permanent color on granite! Granite withheld the test of time because it is impervious to weather and normal wear in the cemeteries. Unfortunately, the paint or stain used to enhance the letters, numbers, and designs on today's granite, have a life expectancy of 2 to maybe 8 years. 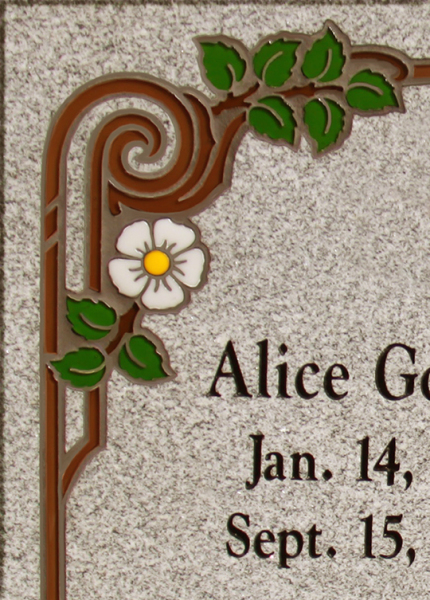 We installed our first sample gravestone twelve years ago. We've tested our inlays to extremes that monuments will never face. In some ways, our finished product is even tougher than the carved granite itself. We have hundreds and hundreds of finished designs that are ready to be manufactured. Many monument companies are ordering finished designs from our catalog, or have their favorite sandblasting designs changed to color glass inlays. Names, numbers, flowers and other designs are available in beautiful permanent, easy to install, annealed glass. We are looking for monument companies who are interested in adding a colorful, new look to their monument business. Our goal is not to oversaturate any particular region, but to make our product available anywhere in the U.S. Please contact us if you have any questions or if you’re interested using our product.